In this part of the WordPress News Theme I finish the sidebar for the theme and create styling for the sidebar and footer. I’ll cover how to style the output you receive from the wp_list_pages and wp_list_categories functions. 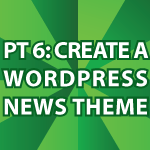 If you missed the tutorials previous to this one check out WordPress News Theme Part 1. All of the code follows the video and you can use it however you’d like. Do you want to allow other people to upload files? For security reasons you should never allow anyone access to upload files unless you are 100% positive they are trustworthy. Is that what you want to do? Good job. Did you learn how to do that from my site?